This place hidden away from the seasons. And sheets of rain fall from the sky. This is where I ride. With choices strewn about a borderless maze. This is where I climb. I finally switched out the tires on my mountain bike. This is perhaps the latest I've made the switch to studs since I moved to Alaska. As I pumped the front tire up to 55 psi, the valve started to make that horrible hissing noise that indicates I have only seconds to release pressure before the twisted tube explodes (I pop more tubes this way than I'd care to admit.) I frantically grabbed at the hose and valve but it was too late. The tube exploded out of the tire right in my face, and the blast startled me so much that I jerked my hand away from the valve and punched the hub hard enough to bruise the entire backside of my right hand. My cat cowered against the door, horrified. I thought I had screwed up any opportunity to ride the ice-slicked streets, but then I found another heavily patched 29" tube stuffed in an old Camelbak. This is my fifth season as a holiday orphan. Every year I tell myself that the expense, work hurdles and hassle of holiday travel isn't worth it, and every year the holidays roll around and I miss my family something fierce. I would even like to go with my sister on her Black Friday shopping frenzy, pushing against the roiling masses of humanity and frantic consumerism just for a glittering piece of something I don't need and never wanted. My own personal Hell would probably look something like Black Friday, but that is how much I miss my sister and the rest of my family. I think about them when I ride, plying the damp streets and chilled air for comfort amid the homesickness. I think about coconut cream pie and ribbon Jello and table cloths that look like flannel sheets. I think about my Grandma lovingly demanding that all 47 of us recite what we're thankful for and I think about my Grandpa smiling as we chatter on about great friends and that super cool concert we went to the week before. I think about the Cowboys on TV and bowling with my cousins and even scoring more than 100 for the first time in my life. I think about Slurpees at 7-11 and sunlight on brown yards and launching sweet air beneath four tires off the train tracks. I find myself lost in memories when I ride around Thanksgiving, every year. And I think about ways I can get home for Christmas, but I know it's already too late. The following is an article I wrote about a couple who is stopping in Juneau next week to give a slideshow presentation about their yearlong, 4,000-mile journey up the Pacific Coast. If you must buy something on Black Friday, I recommend buying Erin's book: "A Long Trek Home: 4,000 Miles By Boot, Raft and Ski." Find out more about it here: http://www.groundtruthtrekking.org. Until then, Happy Thanksgiving! When Erin McKittrick and her husband, Brentwood “Hig” Higman, last visited Juneau, an unseen October drizzle pattered on their tiny rafts as they paddled into the inky darkness along Gastineau Channel. At first, the city was just a small island of lights in a sea of night. Then they could make out the fog-obscured shapes of buildings, and then the crimson stream of car lights on Egan Drive, and then the imposing towers of the cruise ship dock where they landed. 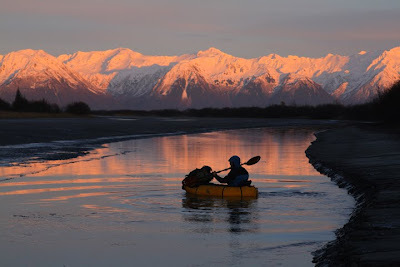 It was the largest city they had seen in several months, and one of the few outposts of civilization along more than a thousand miles of Pacific Coast that they had walked and paddled since leaving Seattle four months earlier, in June 2007. Behind them were a lifetime’s worth of adventures that most can only dream about: Climbing snow-bound mountains, packrafting glacier-lined channels and frolicking in the surf with dolphins. 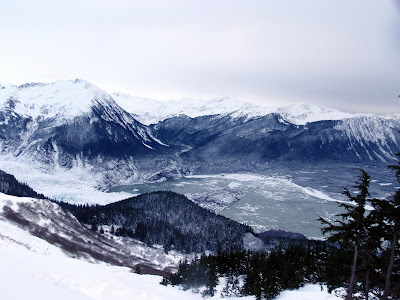 But these experiences didn’t echo in their world-weary thoughts as they approached the inviting lights of Juneau. They only had one thing on their minds: Pizza. The meandering journey that brought the couple to Juneau’s quintessential pizza parlor took them more than 4,000 miles from their former home in Seattle to the Aleutian Islands over the course of a year. From the soggy shores of Southeast to the deep-frozen wilderness of the Copper River Basin, Erin and Hig’s trek brought them closer to their goal — to better understand the relationships between humans, communities, ecosystems and natural resources. As they walked, packrafted and skied, they came to a deeper understanding about their own desires for beauty and simplicity in their lives. Erin and Hig will return to these busy streets on Tuesday, Dec. 1, for a book signing and slideshow presentation about the journey at Centennial Hall. Hig estimated he and Erin took 22,000 photos over the course of the trip, and plan to show at least 100 in Juneau. At the presentation, Erin expects to field the usual questions: “What gear did you use?” “How far did you walk every day?” “Are you crazy?” But she also plans to talk about “A Long Trek Home,” written as a poetic love letter to Alaska, the wilderness and the seasons of the year. In the book, Erin also addresses the environmental issues facing Alaska, such as the effects of climate change, logging and the proposed Pebble Mine. The section of the book addressing the couple’s trek through the Juneau region is titled “Hospitality,” a reference to the Southeast Alaskans who took them in and offered them food and shelter during their autumn visit. 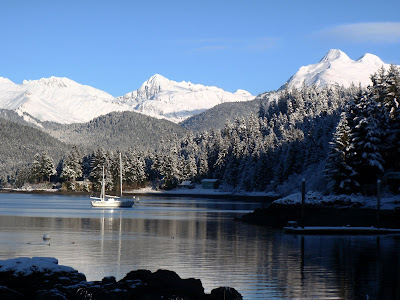 Erin said they left Juneau by packrafting across the Gastineau Channel, walking around the point of Douglas Island, crossing Stephens Passage to Admiralty Island and walking the Glass Peninsula. 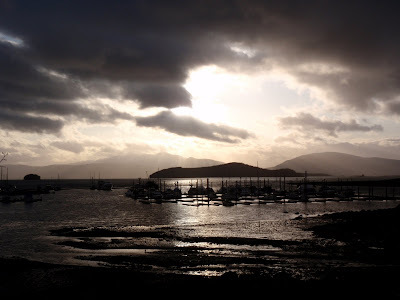 She said at that point in their journey, their movement was mostly aquatic, and the endless series of rain-shrouded islands and channels is a bit of a blur. After leaving Juneau, they still had more than 2,000 miles to trek, and the whole of Alaska’s brutal winter to hike, ski and camp through. But before they could enter the subzero cold and snow of the Interior in winter, they had to pass through the spectacular storms and ice of the Gulf of Alaska. 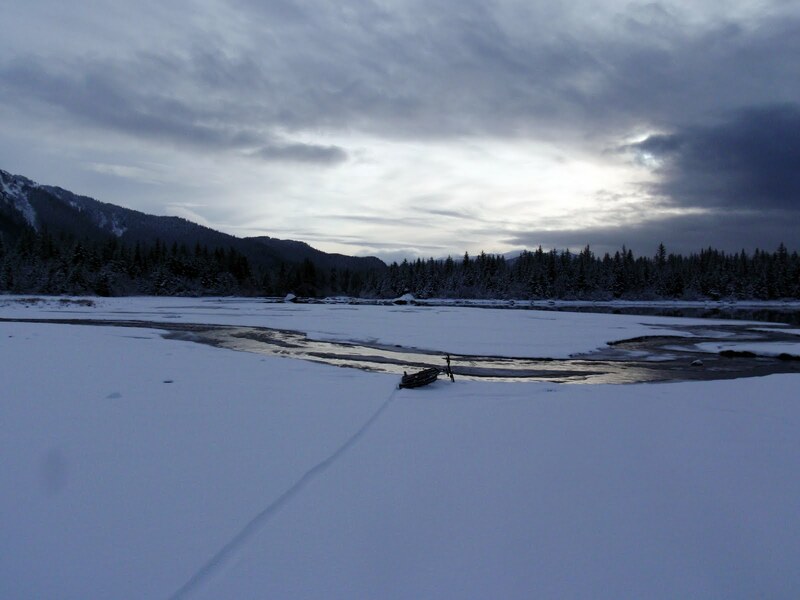 In one of the trip’s more harrowing experiences, Erin and Hig paddled across Icy Bay late into the evening in a rainstorm, fighting wind and current that threatened to pull them into a morass of churning ice. Fear of hypothermia and sinking their rafts amid the swirling bergs kept them paddling even as exhaustion and darkness closed in. “It was a very long, frightening five hours we had no wish ever to repeat,” Erin said. It also become one of Erin and Hig’s more memorable experiences. Their trek ended on Unimak Island, where a treacherous 12-mile ocean crossing keeps grizzly bears, caribou and packraft-bound humans from ranging any farther. At that point, Erin and Hig had been traveling under their own power for more than a year, becoming more accustomed to a simple lifestyle. Erin was pregnant with the couple’s first child. They had endured hunger, cold and powerful isolation, and emerged with an understanding that their future no longer fit with the glittering complexity of the big city. 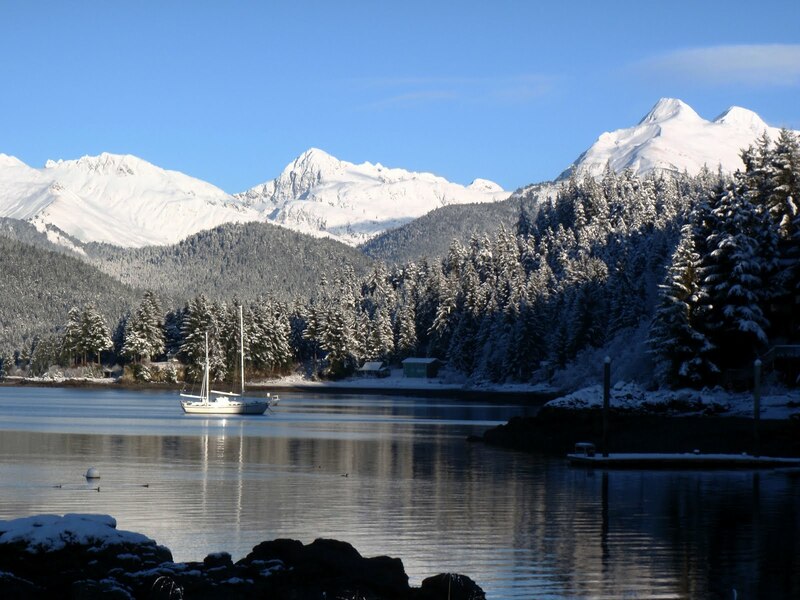 They moved from Seattle to Seldovia, a small village just off the road system on Kachemak Bay, where Hig grew up. They built a small yurt, complete with what Erin sees as a glut of modern conveniences: Internet, a wood stove and little shelves that lock into the lattice of the yurt’s frame. On Valentine’s Day, Erin gave birth to a son, Katmai. Now Erin said the family is preparing for new Alaska wilderness journeys, such as a monthlong trek through the northwestern region of the state with an 18-month-old in tow. A baby may slow them down, Erin said, but he certainly won’t stop them. As to her answer to the common question of whether they’re adrenaline junkies or just plain crazy, Erin said she didn’t feel like walking from Seattle to the Aleutian Islands was any more dangerous than tasks most people take on every day, such as driving on the freeway. Running on the Dan Moller Trail at about noon yesterday. I've been short on time these past few mornings and playing with options for shorter, higher-intensity workouts. Running in the snow has all the intensity of running in loose sand on a beach, except for add a steady incline. I'm in pretty good shape for foot-powered stuff because of all the hiking I've been doing, but my lungs were being put through a shredder. Six miles took just over an hour. Slow but painful. Powerful stuff, running. No matter how you approach it, or where you do it, it burns. Same run, same spot, today. During the descent, I punched through a deep posthole, wrenched my knee, and had to walk down. I've still got the bike love. Lately, I've been genuinely worried about it fading. I mean, these things happen. I rode a bicycle across the country in 2003 and then barely touched it for the next two years. 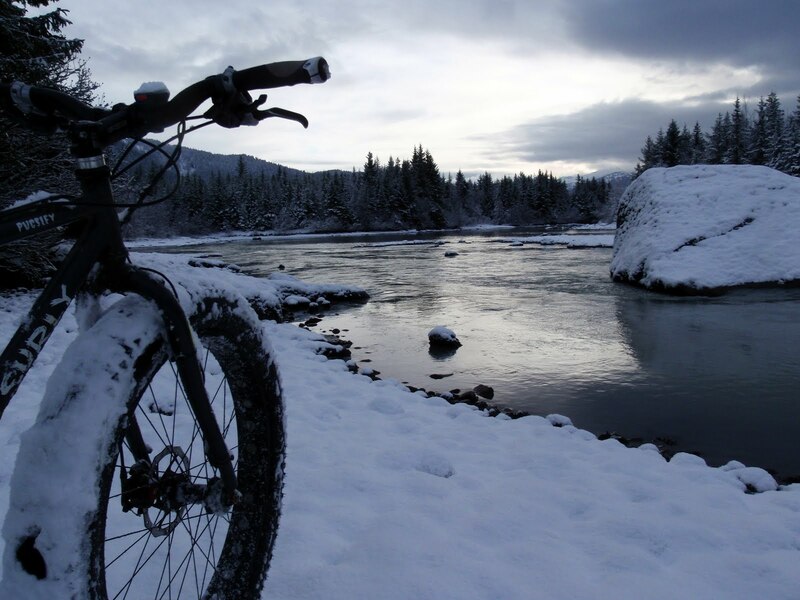 This past summer, with three months solely focused on mountain bike training and a 2,700-mile jaunt down the Continental Divide, was pretty much the bike binge to end all bike binges. I've been admittedly bipolar about the activity ever since. 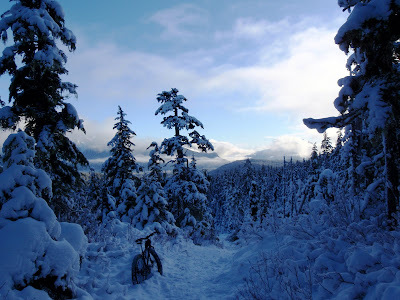 But snowbiking brought me out of my first bike funk; who knows, maybe it can happen again. This is what it looked like when I woke up in the morning. I'm still sick, sore throat and the like, but when you have a free morning and a date with your favorite snow bike, these things just don't seem to matter. I hit up the Lake Creek trail. 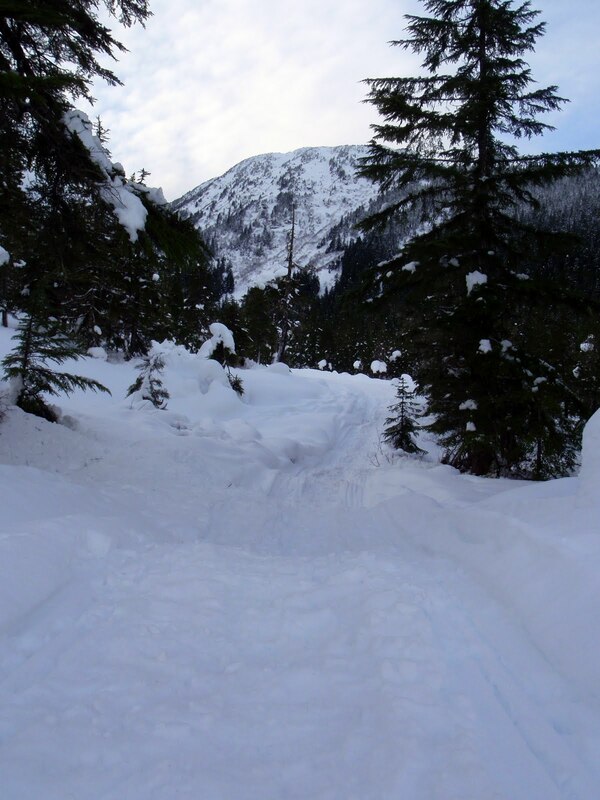 The gate's still closed, the snow's still shallow and the muskeg definitely isn't completely frozen yet, but the trail was surprisingly rideable up to the first meadow. 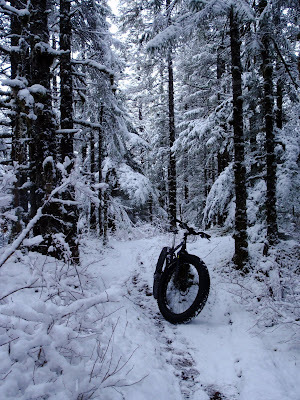 The thing about snowbiking that really makes it for me is the downhilling, picking a line and kicking up powder as the squishy tires hold true to an unseen surface. It's a blissfully weightless feeling, a bit like snowboarding, except for with Pugsley I can hit the flats, the dirt, the pavement, and keep on rolling. 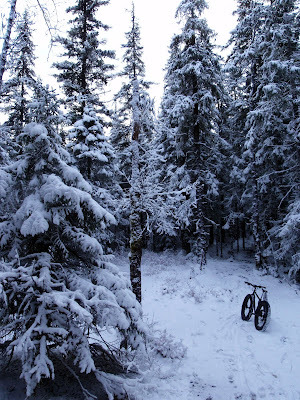 Another thing about snowbiking that makes it for me is of course, the snow. Seriously, how can anyone be grumpy in a scene like this? You almost expect carolers to come out from behind the trees and sing "Winter Wonderland" as reindeer prance about. I haven't been keeping track of my mileage for a good long while, partly because I fear how low the numbers might me, and partly because I don't have working odometers on either of my bikes, and I no longer have a boyfriend who is willing to do small tasks like ordering and installing odometers for a girlfriend who is truly, unforgivably lazy when it comes to optional (and non-optional) bike maintenance. 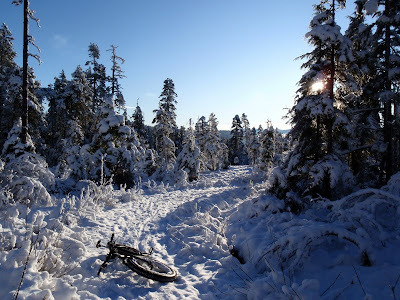 But I do want to start tracking my effort, because I do want to enter a couple of snowbike races in 2010, and I want to be strong and tough and maybe even fast during those races. And I also want to climb mountains, snowshoe run, snowboard, learn to ski, and bomb downhill on my Pugsley. Either way, I think it's going to be a good winter. 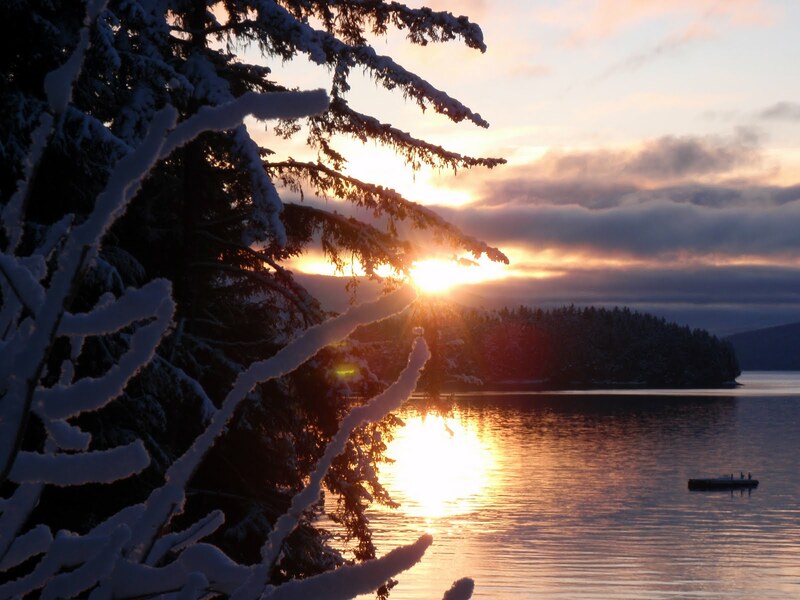 There's one main reason why winter is genuinely my favorite season of the year in Southeast Alaska. Spring has promise and new growth; summer has warmth and ease; fall has color and storms; but winter has stark, seemingly endless, staggering beauty. Of course this beauty begins with snow, lots of it, as it whisks through white, bright sky, dressing the hemlock trees in billowing gowns and smothering the rot and decay on the ground. This elevation on Douglas Island, about 2,500 feet, is already coated in more than five feet of fluff, in mid-November. As the season progresses, snow becomes all-encompassing. 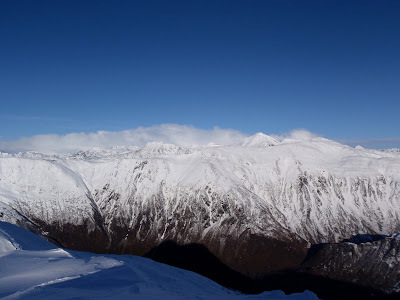 Another catalyst of beauty is the low winter sunlight, which in the north sometimes fails to reach above the mountains. 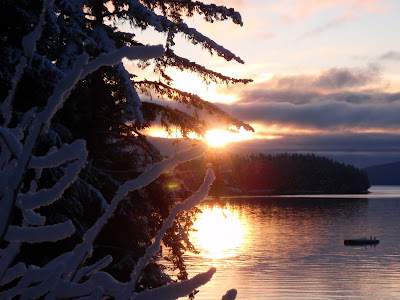 Here in Southeast Alaska in mid-November, the sun lazily stretches out from the southeast at about 8 a.m., rolls over a shallow arch low on the horizon and slumps beneath the mountains to the southwest sometime after 3 p.m. Daylight is short and often smothered in clouds, but each clear winter day feels like a continuous sunrise/sunset, with the low-angle light casting a golden glow and long, dramatic shadows across the shimmering snow. So I think I am coming down with a cold. We here in the Southeast have nothing on the brutal cold temperatures of much of the rest of Alaska, but even spending all day in temperatures in the 20s takes some getting used to, especially when you haven't yet mastered the conservation of body heat or the calorie intake needed to stoke the furnace. After my cold climb up McGinnis I was feeling pretty beaten down, thinking Friday needed to be a recovery day indoors, but then I woke up late to sunlight, casting its morning glow over the mountains at 11 a.m. I don't like to waste sunny days. I'm willing to give them what I've got, even if it's just about everything I have left, leaving me sore and coughing in the evening. The ridge was bathed in golden light and flanked by low-lying clouds. Despite my growing cough and heavy-headed fatigue, I was in heaven. 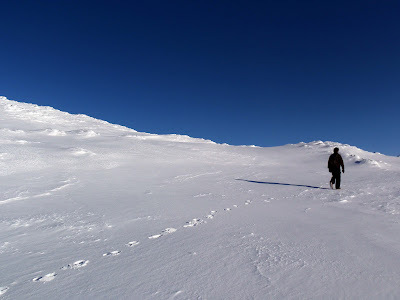 The snowshoeing got tough, with waist-deep powder transitioning invisibly to wind-hardened ice, and me without poles because I had planned on snowboarding (I don't like to carry too many things on my back that could impale me if/when I fall.) 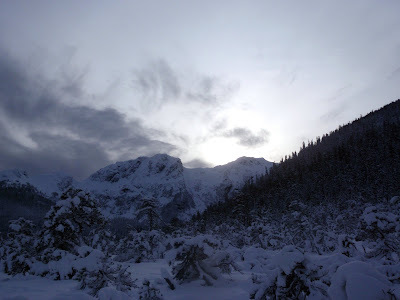 I grunted and dripped sweat as zig-zagged my way up a staircase of short cliffs, taking the hard way to avoid anything that looked avalanche-prone to my limited knowledge, although the snowpack seemed settled and stable. The sun finally dipped below the low clouds just before 3 p.m, casting the last of its yellow light on the mainland mountains. I've become emotionally attached to these mountains, and felt a warm glow as I traced their contours and remembered the moments I spent on their peaks and in their shadows: From left, the high point on the Juneau Ridge, Mount Olds, a small sliver of Clark; then on the next ridge over, Gold Ridge, Gastineau Peak, Mount Roberts, and Sheep Mountain. As the last light left the sky, the mountain called Split Thumb stood alone in illumination. This mountain stands as a symbol of "someday" for me, the hopeful promise of the future. Self portrait on top of Mount Troy at sunset proper. I had planned to go back down the Dan Moller Trail, but it had taken me nearly three hours to get there and dark was not far away. I'd never before done the "traverse," but when I saw skin tracks I started following them down the other side of the mountain toward Eaglecrest Ski Area. I took long, loping strides through the deep powder to the side of the tracks, feeling as weightless and effortless as if I had been on my board, and arrived at the ski area in less than a half hour. I tromped down the slope and stuck out my thumb. A couple of tele-skiers drove me 12 miles back to where I started, scrunching their noses at the ice-crusted snowshoes hanging from my backpack. "You need to get some skis," they told me. Maybe, I replied, but it certainly would be a long learning process before I could take skis to the places I had visited that afternoon. 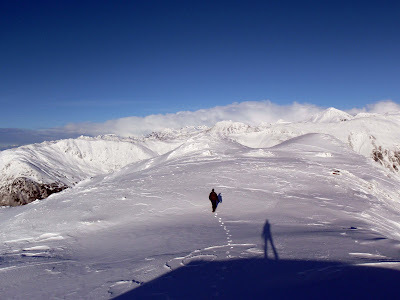 I asked them if they saw the sunset, and they told me they spent all afternoon in the Wedding Bowl, making looping runs through the powder beneath the shadowed darkness of the Douglas Ridge. "So you didn't see the light and the clouds below Admiralty?" I asked them. They shook their heads. All of us sat back, satisfied with our own methods of adventure. My friend Bjorn is teaching me how to climb snow-bound mountains. It is not an enviable task. First, you take this rank beginner person whose natural inclination toward vertigo has led her to avoid climbing all of her adult life, then drag her up to a cold and barren environment that is completely unforgiving of any error. I certainly don't try to hang out with people who may turn out to be liabilities, and yet Bjorn was the one who called late last night and asked if I wanted to accompany him on a November trip up Mount McGinnis. We both brought snowshoes but never took them off our backs. 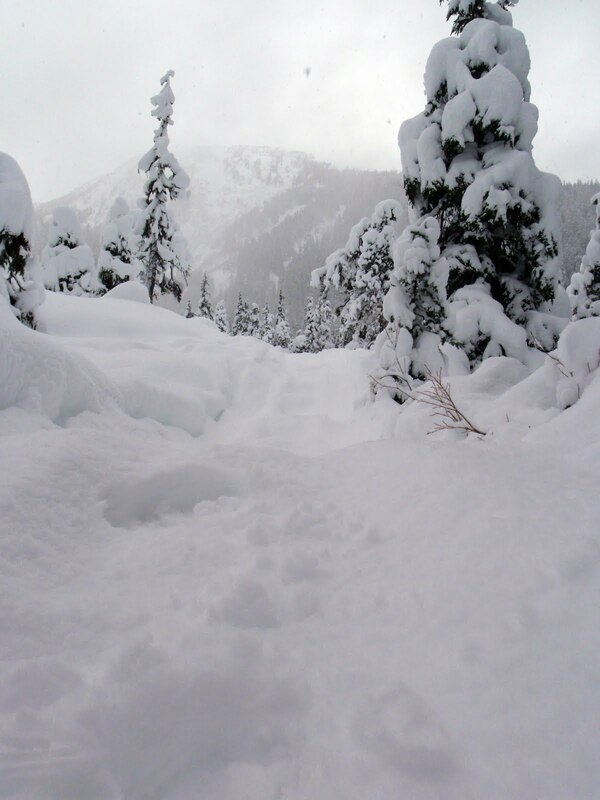 The snow was weird and unconsolidated, meaning I was slipping on frozen grass even as I stood in knee-deep fluff. 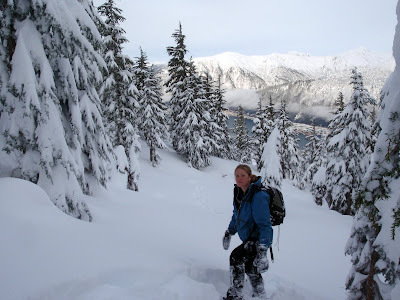 We picked our way up a thickly wooded area between two large avalanche gullies, using tree branches as pull-up bars to lift ourselves over chin-high bluffs and grabbing at thin blueberry twigs when the footing gave out underneath us, which happened frequently. It was surprisingly strenuous, more new stuff that I'm not quite in shape for, and a couple of times I had to concentrate hard to direct all of my power to my quads just to thrust my body over another waist-high step. Feel the burn. 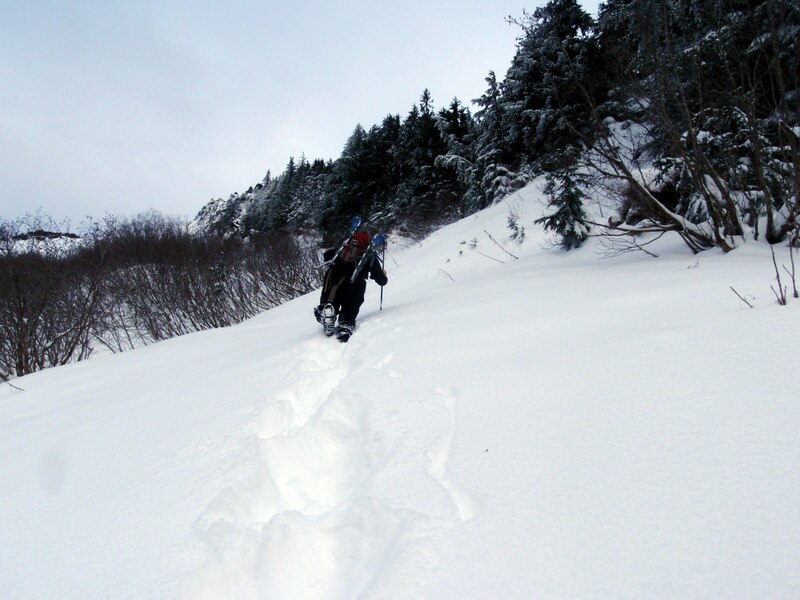 We broke out of treeline and entered a very steep, icy slope. 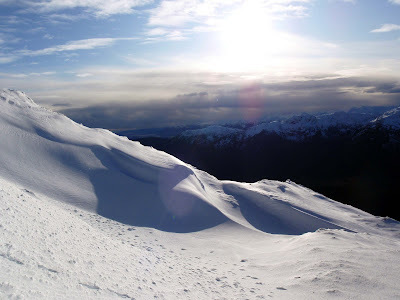 It was the kind of snow slope that as recently as three months ago would send fleeing downhill for fear of slipping, and this was during the soft, slushy summer months. Now these slopes were covered in a hard crust, so much so that Bjorn had to use his ax to carve out steps so we could climb. I waited patiently behind, watching low-level clouds move in fast from the south, quickly losing heat because I was not working very hard. I started shivering but I didn't want to take off my pack and pull out more layers, for fear of throwing off my balance. We reached a wind-scoured saddle, with exposed rock and grass and a lot of solid ice, and decided it was time to put on the crampons. 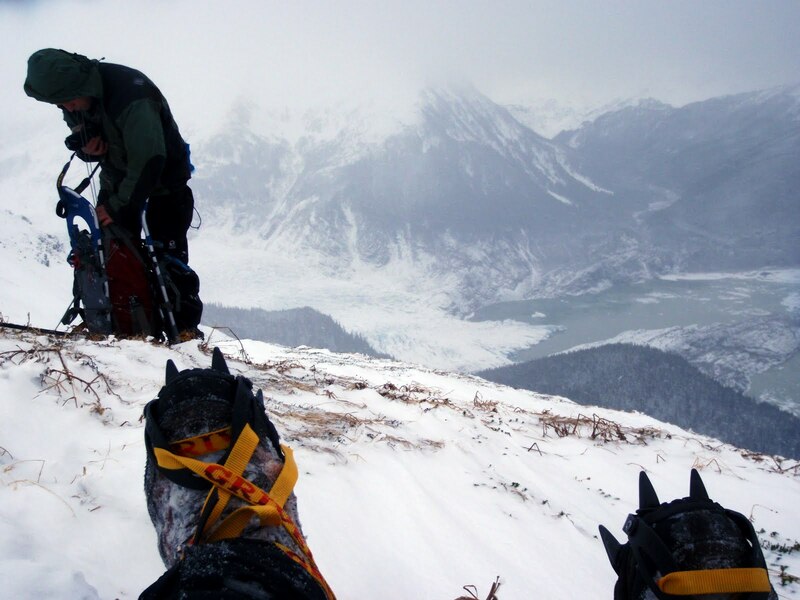 My first time in crampons. I never actually took the time to practice putting them on before, so I played with the straps and fiddled with the adjustments while my fingers quickly went numb in the strengthening wind. The storm moved in as I sat there. 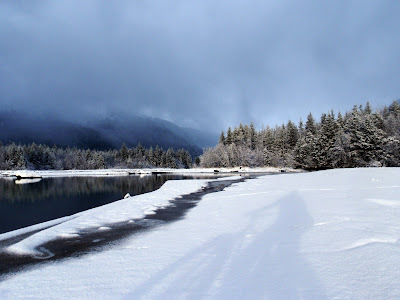 Temperatures and visibility both plummeted, and streams of snow hit us sideways. I was worried about descending our ice steps in low to zero-visibility, and Bjorn agreed that it would be pretty sketchy, so we decided to turn around shy of the summit. I didn't feel sad about that. After all — it's just McGinnis. I didn't feel all that afraid about descending, either. Bjorn gave me a tutorial about walking in crampons, and how I needed to take extra care not to cross them and spur a big fall. Then we saw ptarmigan fluttering around the ridge. Bjorn wanted to get pictures, and I decided to take a few admittedly bad ones with my point-and-shoot. 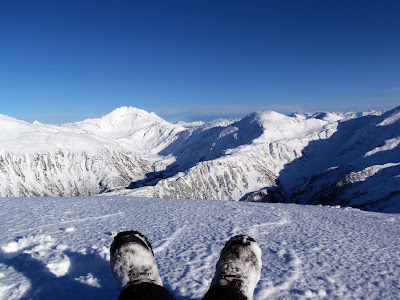 As numb as my hands had gotten putting on my crampons, as a cold as it had become and as low as my core temperature was getting, this was a stupid idea. I lost all feeling in my right thumb. I've done this enough to know the difference between numb and partially frozen. I put my mittens back on and braced for the downclimb. McGinnis in all of its wind-scoured glory. We slowly and methodically worked our way down. 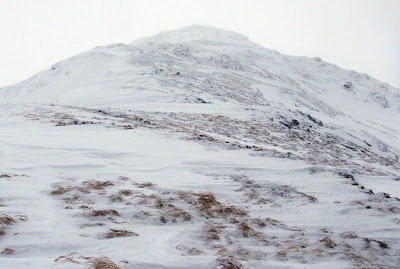 Despite the security of the crampons, I did much of it backwards, tracing my way down the snow steps. It felt just like climbing down a ladder, and was somewhat disorienting in the way ladders can be when you spend all of your time looking for the next step rather than observing the terrain around you. Just as I was doing this, my thumb starting to come back to life. I had mixed feelings about this. On one hand, I was happy because I knew the thaw meant my thumb was still very much alive. On the other hand, thawing body parts is remarkably painful. It's like having someone hold a hot iron to a crucial appendage while you're trying to concentrate on something difficult and scary. My thought process for the next 10 or so minutes went something like this: "OK, feet apart ... GAAAAAA thumb! ... pant, pant .... Ok, step slow .... UGGGGGH ... feet apart ... thumb, thumb, thumb, stop, hurting, please ... OK, down .... GAAAAAAA!" It finally dissipated just as we were getting back down into the subalpine. My thumb is a little sore and shiny red now, but for the most part it's fine. It was a little refresher course on the perils of too much skin exposure when I'm already shivering. And I learned a little about the wonders of crampons. Many valuable lessons were learned today. Thanks, Bjorn. The other day, while I was musing about starting to train for the Susitna 100 and/or the White Mountains 100 (i.e., my winter bike race season), a friend asked me if I planned to start doing intervals. I avoided the question, unwilling to admit that I was still planning on training for real races that involved bikes by doing whatever I felt like doing, which recently hasn't involved nearly as much cycling as my previous winter bike race seasons, and even less in the way of something resembling an interval. 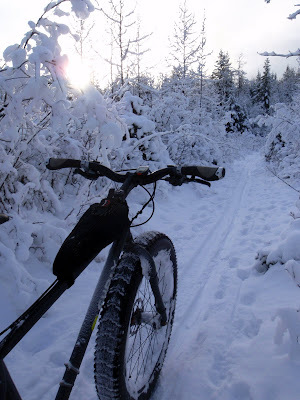 "There must be a way," I thought, "to incorporate strenuous, lung-busting workouts, like the kind you get when you sit on a bike trainer and pedal really hard for three minutes and more slowly for one, into an winter outdoor activity that is actually fun." 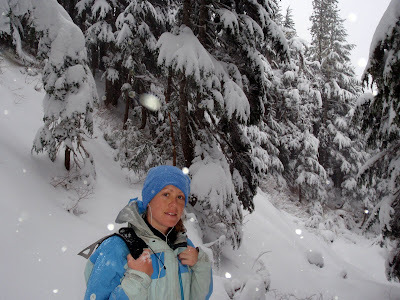 Snowshoeing. Now stay with me here. You take a layer of bottomless fluff and spread it over a slope that varies from 30 to 60 degrees. Then you try to climb it, for two and a half hours. The result has all of the upper-body thrusting of swimming, the lactic-acid-generating leg work of speed-interval cycling, and the raw power of running. My heart still hurts. I tried for the top of Mount Jumbo today, stupidly thinking that if I gave myself an extra hour than what it usually takes me during the summer months, maybe I'd make it to the top. I didn't even come close. Trekking poles may have helped, but not much. I worked close to my maximum capacity for much of those two and a half hours, weaving up the steep slopes and swimming straight up hill when the trees closed in, stopping frequently to catch breaths, then hitting the max again. I made it about two-thirds of the way up to mountain, to about 2,500 feet, before I absolutely had to turn around to make my work meeting. It ended up taking me about 55 minutes to descend what had taken me two and a half hours to climb (and would have been less had it not been for the icy exposed roots below 800 feet.) My summer split between climbing and descending this mountain is almost exactly 50-50, and the hike rarely takes me more than three hours total. Weather permitting, I am strongly considering going back to this same mountain tomorrow to take advantage of that nice trail I broke, and aim for the top. I woke up late and intended to bike commute to work today, so I set out for a meandering pleasure ride through the Valley. Friday's strong cold front brought 170-knot winds to Sheep Mountain and mudslides to downtown, but it also brought something nearly everyone at city level has been craving — snow. This isn't exactly what I consider snow biking — it's a soft dirt trail with a couple inches of fluff on top. 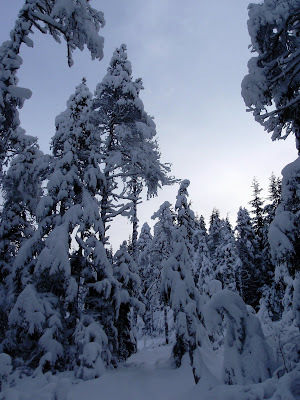 But it is sweet just the same — the silence and simple beauty of white powder, the brow-furrowing challenge of negotiating well-disguised-but-not-yet-buried roots and rocks. Basically everything that Pugsley is good at, but then again, Pugsley is good at everything. The Dredge Lake trails always flood in the fall, and they haven't yet completely frozen, so riding around the glacier moraine was a fun mix of powder skimming and "bike-swim." I circled my favorite singletrack loops a couple times and veered onto the beach, where the sand was partially frozen and firmer than usual despite a blanket of snow. 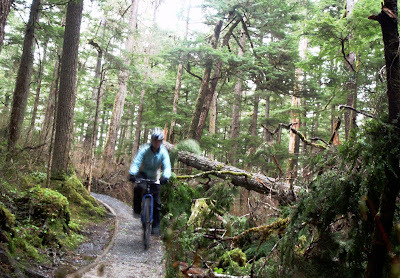 I veered left and started following the Mendenhall River, biting my lip and throttling the grips as I tried to bulldoze small boulders that I could not see. It was a fun challenge, and I wanted to see how far I could follow the river downstream — something I had never tried before. I have been reading "A Long Trek Home" by Erin McKittrick, who in 2007-2008 walked and packrafted 4,000 miles from Seattle to the Aluetian Islands with her husband, Hig. She's coming back to Juneau for a book tour at the end of the month, and in anticipation of an interview with her on Monday, I've been speed-reading her book, which is beautifully written. It also inspires me to consider the possibility of overland, off-trail adventures in my region. 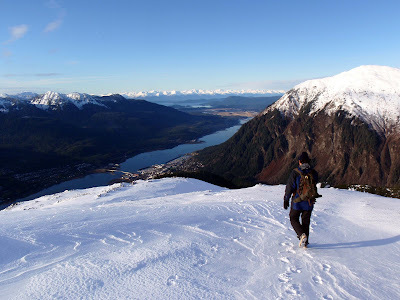 After all, Erin and Hig managed to walk away from downtown Juneau, cross Stephens Passage in a packraft, and eventually end up in Anchorage and beyond. As someone who often feels trapped in a town disconnected from the North American road system, the idea of walking away from here is a beautiful dream. 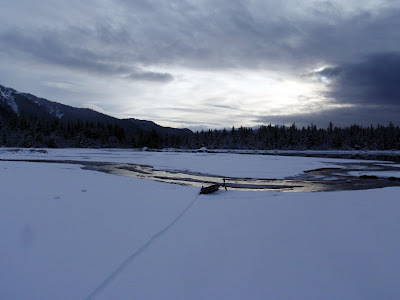 I followed the river bank until a bend forced me into the woods, where I connected up with a faint deer trail and rode on the soft moss, weaving between trees, through spaces so narrow I could barely fit through most of them (and couldn't fit through the rest.) I thought I was heading toward the main trails, so when I got tangled in alder thickets, I kept pressing forward. Then I reached an impossible bushwhack, veered left, pushed forward, turned right, and found myself inexplicably back at my own track. 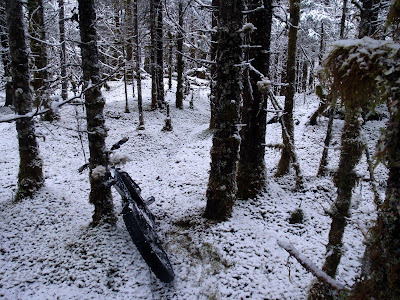 I turned the other direction, continued for a while at what I thought was mostly forward, and found my own track again, except for back a ways, where I was still riding and there were no footprints. It was impossible to tell which direction the track was headed. #$@! I was lost. Funny how the simple act of being lost is so unnerving, even when you are in a small area and know that if you just picked a direction and walked in a straight line, you would fairly quickly come to a familiar place. But I was sick of bushwhacking with the bike and didn't want to go all the way around the lake again — I had pretty much already used up my time window for bike commuting and was going to be late for work as it was. 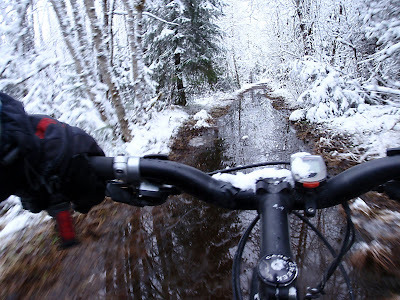 So instead of following my path, I crossed my fingers that the river was to the right and pushed blindly through the alder thicket, with snow-covered branches slapping my face and grabbing my bike from all corners. I just yanked and thrashed and swore. I'm probably lucky I didn't snap a derailleur. I did sustain a few scratches on my neck. But I emerged from the thicket to this place, this tranquil beach, with small hints of sunlight stretching beyond the clouds, and the trail entrance in clear sight. Happiness is forging your own route ... and finding your way back. There is an incredible wind and rainstorm going on outside right now. Boats are knocking around in the harbor. Water is streaming across the road at a hydroplaning velocity. 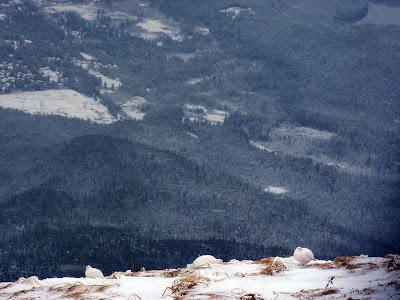 The Sheep Mountain weather tower at 4,000 feet recorded wind gusts of 115 mph, which on the East Coast would be a Category 3 hurricane, with below-freezing temps and daggers of snow. Here at sea level, we're getting gusts to 65 mph. It's entirely too insane to try to pilot any kind of bicycle. I wavered on going out for a run. I'm still wavering. This reluctance to go out in insane weather has instilled a certain sadness, because it reminds me that I'm not training for the Iditarod this winter. There's a sense of loss, not having that in my life, which right now means I don't have even a remotely rational reason to go out and face the 65 mph blowing rain with a sense of duty. 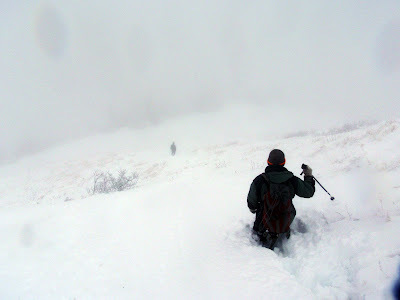 Now, if I go out in the hurricane, it's because I'm crazy enough to go out in the hurricane, not because I have to go out in the hurricane to learn crucial survival skills, and have the wherewithal go out into the Alaska backcountry and experience the scope and awe of deep winter. 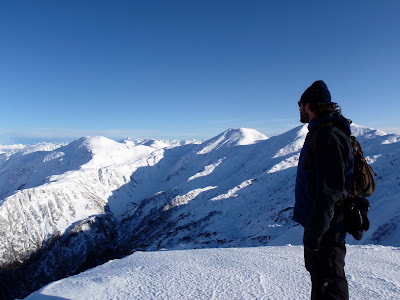 I have been continuing my mountain walks, which in their own way bring that scope and awe closer. On Wednesday I headed up Thunder Mountain in the fog with Bjorn and his brother. They wore fleece pants and cotton T-shirts, but I got my first taste of snow-stepping on a short but near-vertical, icy-hard pitch. Thursday I did a long bike ride out the road - probably the last I'll be able to comfortably ride on the skinny tires this year. 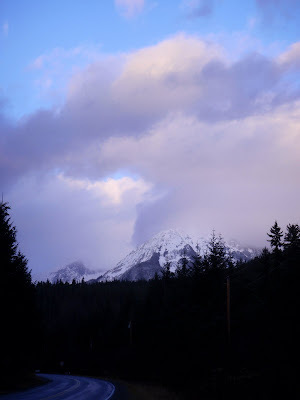 The air was nearly calm, and a lingering sunset bathed the mountains in lavender light. 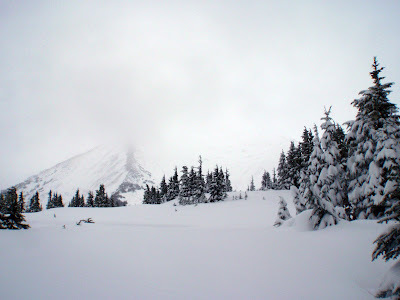 On Friday, I hiked up the Grandchild route in a snowstorm. A thin dusting of snow soon became waist-deep up high. I relished in the brute exercise of wallowing, pitching myself forward like a loping bear, but I was regretting leaving the snowshoes at home. Outside my outside life, it's been a strange kind of week, and it left me feeling in a somber mood, wallowing solo in that frozen, black-and-white world, shuffling through music like Bonnie Prince Billy ... "a hard way to come into a cabin, into the weather, into a path, walking together. A hard one." The Sun Bowl in a snowstorm. Wind whisked through the trees, but in the lolls, it was eerily quiet. It took me a while to climb up there and I continued upward far too late. I had to climb down a ways in the dark. I was prepared for it with a headlamp, but I haven't yet become accustomed to that deep, penetrating loneliness of the winter forest at night, with its ghost trees looming ominously over hollow black space. I was more than ready to rejoin civilization at the bottom of the mountain, at what felt like midnight but in reality was 5:30 p.m. I put away my pack and ax, changed out of my ice-crusted shoes and shells, and went to see "Men Who Stare at Goats." The alarm clock went off well before sunrise, to a morning thick with fog and drizzling rain. 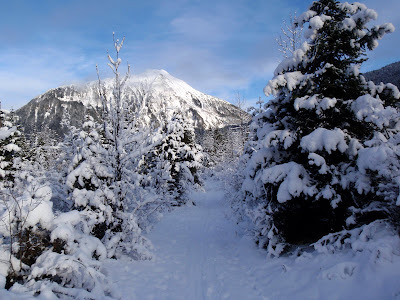 Sean and I had harbored ambitions about Mount Olds, that scary mountain that I couldn't summit a month ago — and now it's November and requires snowshoes and an ice ax and an avalanche beacon and seven hours of free time before work. Those ambitions dissolved in the cold rain, and it was not hard to let them go. Sleep comes easily to the relieved. 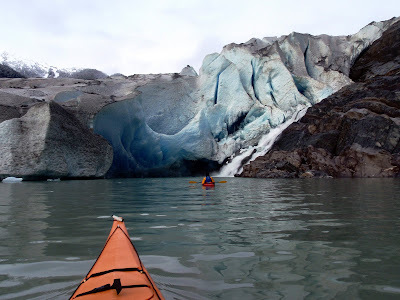 And just like that, it was nearly 10 a.m., and I was just about ready to give up on the day when Sean suggested we go sea kayaking on Mendenhall Lake instead. I really wanted to, but wavered. For reasons that wouldn't make any sense to him, I am every bit as scared of paddling across the calm surface of a lake as I am of climbing a 4,500-foot monster mountain on November 10. I have an irrational fear of water that runs deep, which I can trace back to the time I accidentally wandered into a water-blasting ride at Sesame Street World in Texas at age 3, or fell into a fishing pond at age 4, or ended up temporarily trapped underneath an inflatable "water weenie" while being towed behind a jet boat in Bear Lake at age 8, or being swirled around in a keeper hole while tubing through Lava Hot Springs at age 18, or catching a rope around my neck underneath a whitewater raft in Cataract Canyon at age 21. I have frequent dreams about drowning. Water haunts me in a way that nothing else can. I wish it wasn't this way. I'm actually a naturally strong swimmer; I'm convinced I could build up impressive endurance for long, difficult swims if simply training for them didn't make me so uneasy. Also, I live in one of the most amazing water playgrounds in North America, a passage of rivers and channels and fjords and great swaths of wilderness that can only be accessed by boat. So I try to take my baby steps away from my fears, but I can't say it's not difficult. The late morning was calm and cool, about 38 degrees. I pulled on a pair of fleece gloves because they were all that I had, but my fingers quickly went numb as I started to draw the paddles through the teal-colored water. 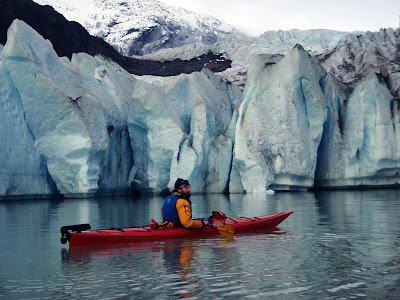 The nose of my borrowed kayak plowed through a thin veneer of clear ice and the boat teetered. My heart nearly stopped. Calm water is not too intimidating for me - like I said, I'm a pretty strong swimmer. But the temperature of Mendenhall Lake, with its waters that until very recently were frozen in the Mendenhall Glacier, registers at just a few degrees above freezing this time of year. Tip a kayak that I have no skills to flip back over, and I'd have five, maybe 10 minutes tops to swim to shore before I succumbed to hypothermia. So the tiniest little jolts would make my heart race and head pound. But eventually, I started to find my flow, and came to the conclusion that this boat probably wasn't just going to randomly toss me into the calm water — given my irrational fear, a truth difficult for me to accept. We made it to the face of the glacier and hauled out on shore. The last time I was out this way was January, when the lake was frozen, and I don't remember this particular rock wall — I'm fairly certain that it wasn't exposed 10 months ago. 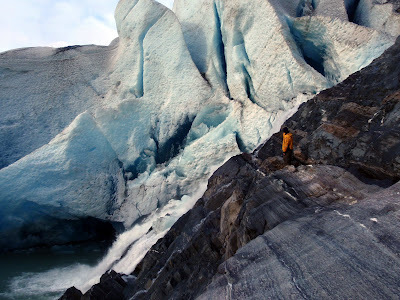 That's how quickly the Mendenhall Glacier is melting. 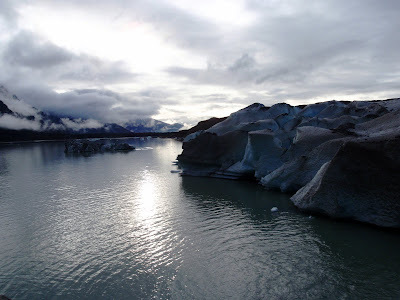 My friend Brian tells me that in only five or so more years, the glacier is going to permanently lift off the surface of the lake, and we'll no longer be able to paddle (or in the winter, pedal) right up to its face. It's sobering, to see how quickly great things disintegrate. And with that came a feeling of tranquility ... acceptance of loss and fear, and human ability to keep moving through both. They say you should do one thing every day that scares you. 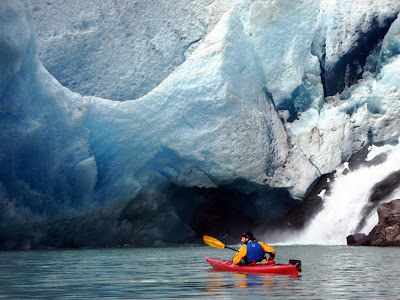 As I skimmed the smooth water through a maze of floating ice formations, I was amazed at how peaceful that act felt. For a comprehensive guide on how to choose the best kayak for you, visit https://www.globosurfer.com/best-kayaks. Another stellar day today. Sean and I were able to get out for a fun hike up Gold Ridge - a little wallowing in waist-deep drifts on the way up, and a little sledding on our butts on the way back. I'm plotting another adventure, so I don't have much time to blog tonight, but I wanted to post my pictures. 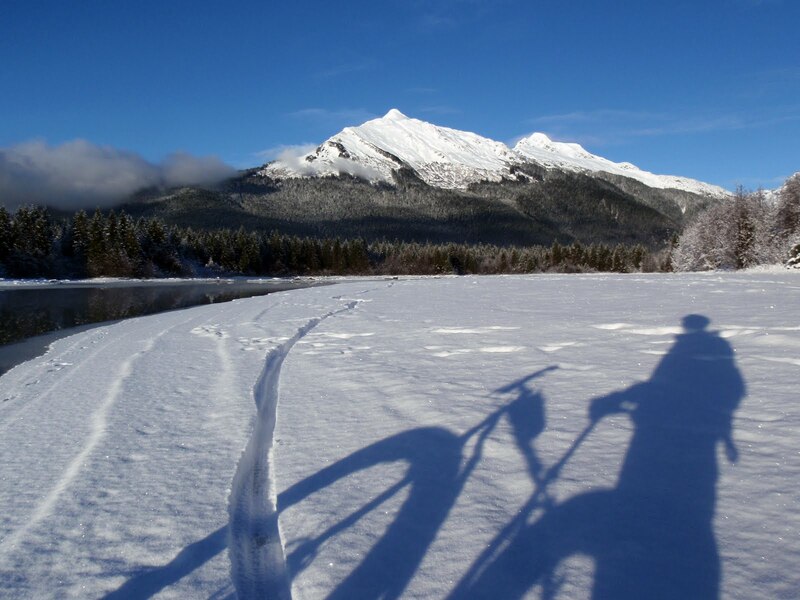 Bluebird sky and sparkling snow — it's like a divine, calorie-burning dessert. I'm a happy hiker. 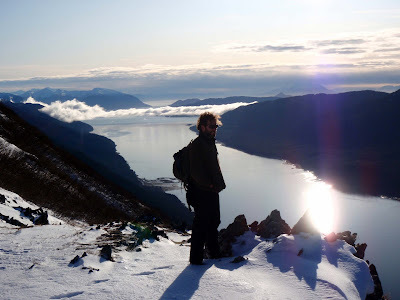 Sean standing over Gastineau Channel. This is before the wallowing began in earnest. 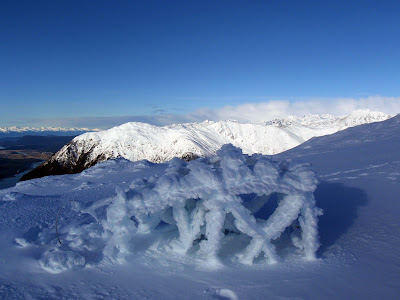 The wind-drifted snow created cool ice formations. 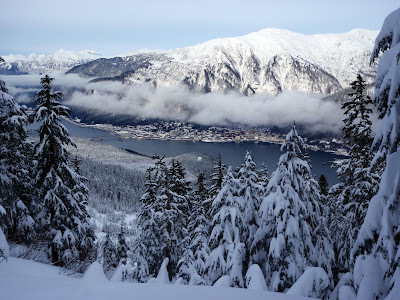 Juneau's version of the desert. Sean walks along Gold Ridge. I really like this photo. 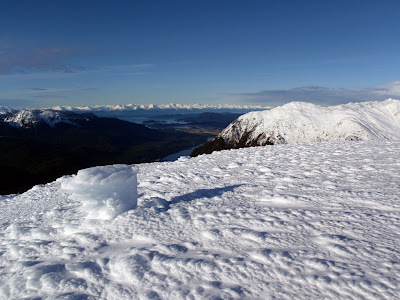 The Juneau Ridge and a fog-shrouded Blackerby Ridge in the distance. Looking toward Sheep Mountain and Clark Mountain. This tower of unknown origin toppled over and was devoured by rime ice. 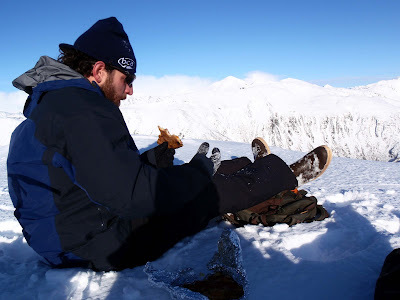 Sean brought homemade pizza, topped with asparagus, tomatoes and Yukon Gold potato slices, to snack on at the top. It wasn't even frozen yet. As we slid down, clouds started to move in from the southwest. Heading back down to town. Total distance was about eight miles. Total time was four hours. The waist-deep wallowing definitely slowed us down, but for the most part, it made for a relaxing morning. For some reason, I feel a little guilty leaving it at that. Maybe I should take an "Up in Alaska" reader poll. Does anyone think I should spend more time writing and less time taking photos of mountains?